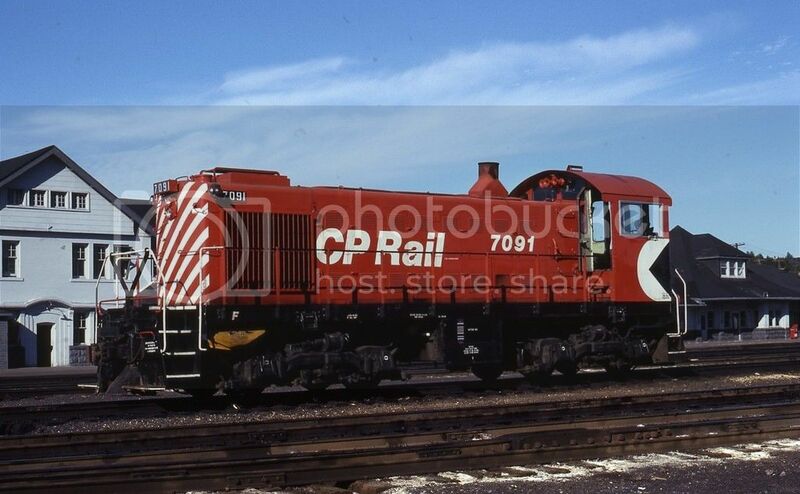 Aside from our gang at the WRMRC, and the remaining local railfans who lived in the Sudbury area back in the 1970’s, few people know of the legend of CP #7091. This was one of four MLW-built S-2 switchers the CPR assigned to Sudbury yard from dieselization until the early 1980’s, all grouped in the early-7090 number series. They were all specially equipped with passenger buffers for passenger car switching (necessary for shunting cars off ‘The Dominion’ and later ‘The Canadian’ within the Sudbury terminal) so the group never strayed far from home over those decades. The “legend” so-to-speak, was that the Sudbury shops personnel (who not only performed car repairs, rebuilding and repainting, but also local diesel running repairs and repaints) continued to repaint the 7091 in maroon and gray script well into the 1970’s, and they avoided sending the unit to Angus for any heavy repairs, knowing the unit would probably return wearing Action Red. Over the years of collecting photos for our club archives, we quickly concluded this local legend of the 7091 was no legend. This was fact. 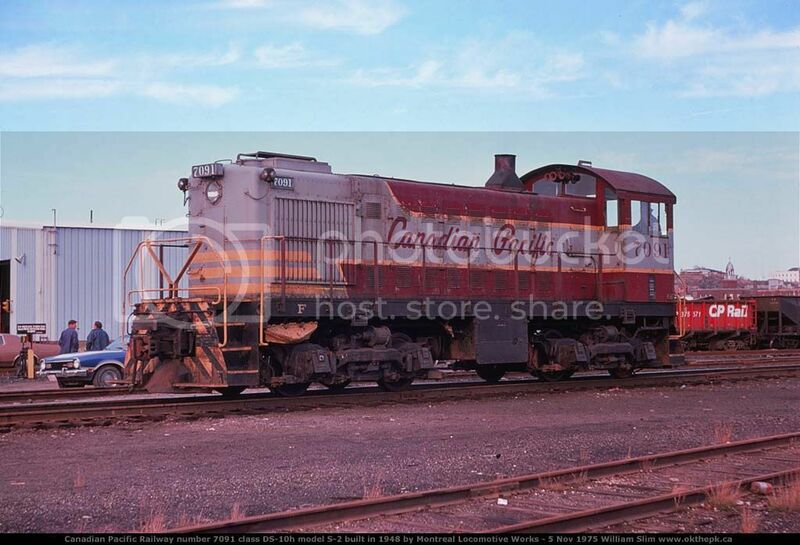 Any 1970-75 era photos we found of the 7091 revealed a unit in relatively good looking maroon and gray script paint. For those unaware, the old scheme tended to weather poorly. So the pics were showing the Sudbury shops were indeed pampering the venerable old gal. The plan worked for many years, but inevitably all good things must come to an end. One day a CPR big-wig from Montreal showed up at the division headquarters and, as the legend goes, saw a freshly painted maroon and gray 7091 working the west yard lead. And that was the end of that. 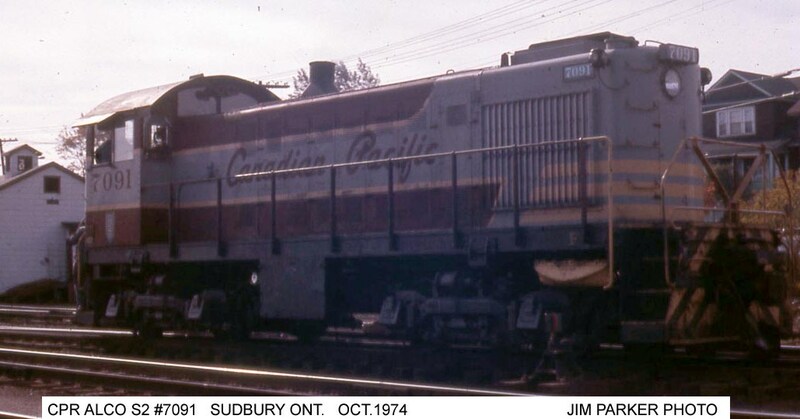 The investigation (and frustration) began after I first studied this photo of CP 7092 in Sudbury dated 09 August 1975. Notice at the very right edge of the photo, coupled in front of the 7092, is a maroon & gray script painted MLW switcher which we can safely conclude is the 7091. All the other Sudbury MLW switchers were Action Red by this time, and had been for many years by then. Nothing unusual about it, or so I thought, until I reviewed some other photos in the hopes of nailing down exactly when the 7091 was repainted. 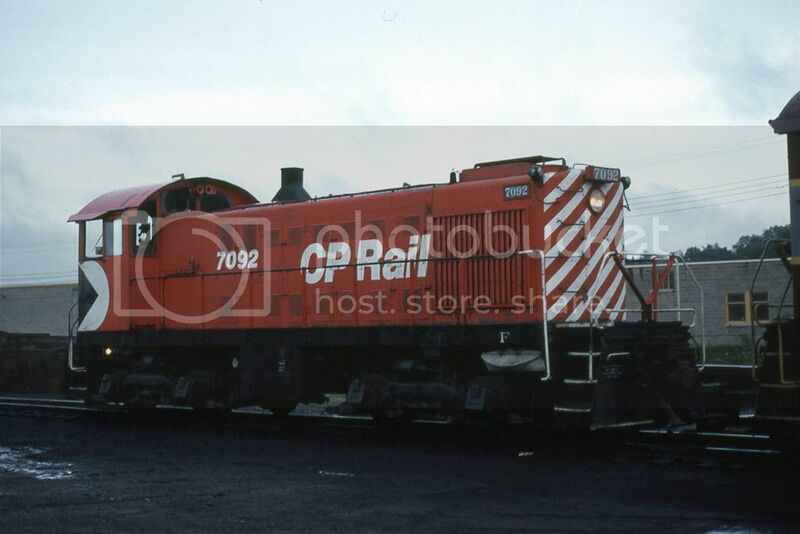 Here is a Jim Parker photo of 7091 dated October 1974. OK it’s unquestionably Sudbury because that old white icehouse was a definitive landmark. The icehouse was razed sometime by the end of 1974, so it’s feasible this photo was taken while the structure was possibly days away from demolition. Also we have a photo labeled from 1975, so it obviously would have been in this scheme the year prior. Now here is another photo by the Sudbury shops building with the date identified by the photographer as 05 November 1975. This is pretty late into the Action Red era. Back then, railway image was still a big deal and the CPR was aggressive in repainting things into the current image. Also, notice the scheme is getting a little worn here unlike the fresher look in that 1974 photo. So all is still well, and we can assume the 7091 lasted like this into 1976 possibly. Now here is where the mystery begins, this shot of 7091 was posted in rrpicturearchives.net and the author wrote it was taken on Canada Day in 1977. Holy cow! 1977 and (never mind the colour shift in this reproduction) the paint is really fresh! Boy those guys in the Sudbury shops had guts keeping 7091 looking like this. Problem is I eventually found that this date has to be bogus. The author probably took it on the 1st of July, but it can’t be 1977. That’s because here is a photo of the 7091 in action red candy stripes in a shot dated July 1978. So what’s the big deal? That was 1977 and this is 1978. So it must have been painted sometime in between right? Well no. The 5″ ‘Candy Stripe’ scheme lasted until the fall of 1976, and was then replaced by the 8″ wide-stripe scheme. So that shot of 7091 could not have been taken in 1977, since this unit wore narrow stripe paint. It had to have been repainted sometime before 1976. The ongoing mystery here is we still do not have a definite date as to when 7091 was finally repainted into action red. However, we have found enough photographs of her online listed as 1975 to conclude it probably lasted that long. · We are reasonably certain the repaint happened some time between late autumn 1975 and June 1976 (when CP adopted the 8” wide stripe scheme). · The Sudbury shops did indeed keep 7091 in good shape, as the legend went. · You can’t totally trust the internet. That should seem obvious. But even in railway modeling, try to find as many sources of information as possible. So in conclusion our club needs two models of the 7091, one each wearing different schemes. The script unit operates in sessions representing 1970-75, and the candy stripe unit for 1976-79. No wonder prototype modeling wasn’t very common prior to the internet age. How could anyone figure this stuff out before?